After a little research, I learned it is a 1973 Super Stitcher chain stitch, hand-held sewing machine made by Southbury Manufacturing. 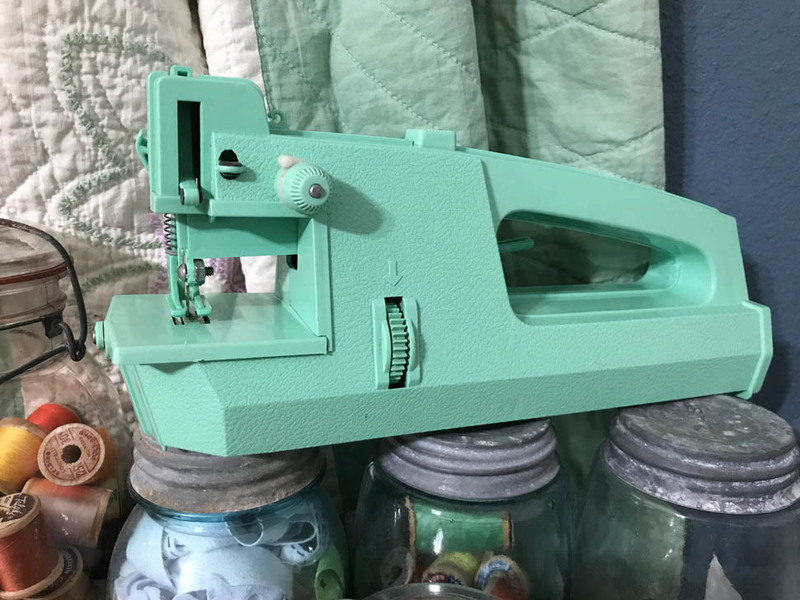 It will join my ever-growing toy sewing machine collection (I'm up to 17 now! Whoops, just spotted another one, make that 18. Lol!). 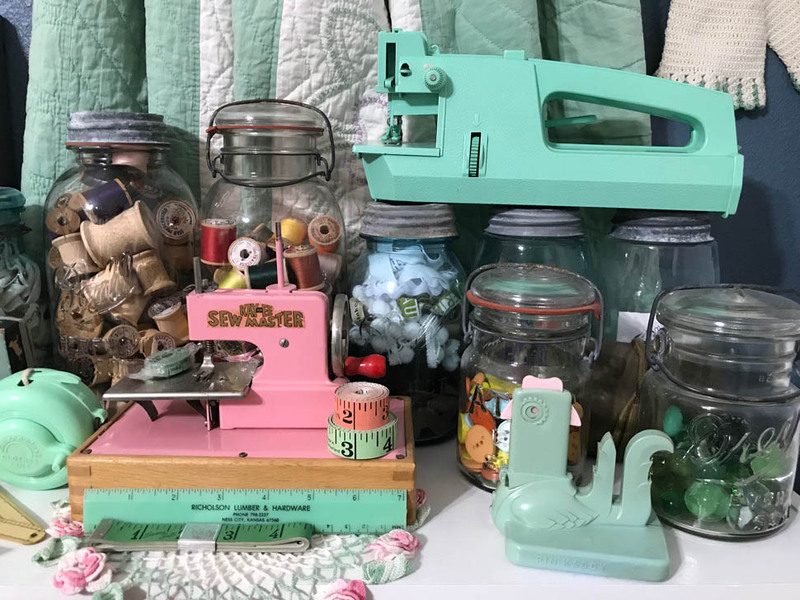 Who else can't pass up a cute little sewing machine? 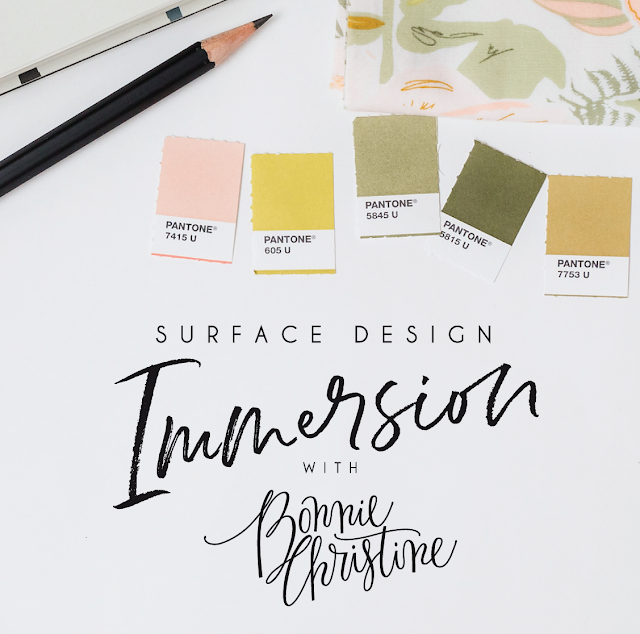 Just a friendly reminder that there are literally just a few hours left to register for my friend Bonnie Christine's Surface Design Immersion Course! This 8-week course is the bomb!!! I've learned so much about surface pattern design, using Adobe Illustrator, creating repeating patterns, finding my style, creating a brand....I could go on and on (and I have in my past posts this week)! I've also found a new group of friends and peers to enjoy the journey with and have made life-long friends at the Immersion retreat. I hope you'll join me this year for the incredible learning experience. Just click the link below for all the details about the course and how to register! 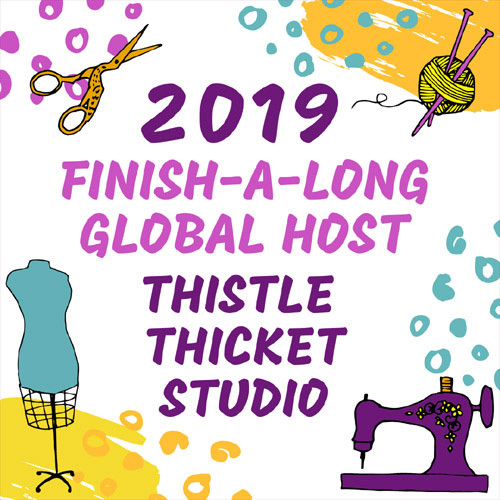 Registration closes tonight - Tuesday, February 26 - at 9 p.m. EST (that's 8 p.m. for my friends in Central time) and won't be available again until 2020! So don't wait another second to join! They say that all work and no play makes Jack a dull boy - or Sharla a bored girl! I tend to get really focused (my husband says obsessed) on whatever I am working on. That focus can take the fun out of things and it feels more like work. But Bonnie Christine has given me permission to play - play with pencils and paints and just create and have fun! 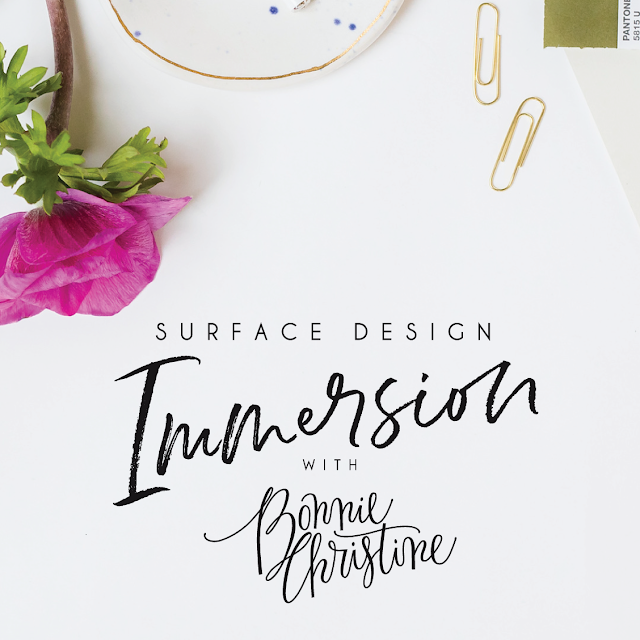 It was one of the most liberating feelings I experienced through Bonnie's Surface Design Immersion course. If you, too, are missing the joy and fun in your artwork then I encourage you to register for the 8-week Immersion course! 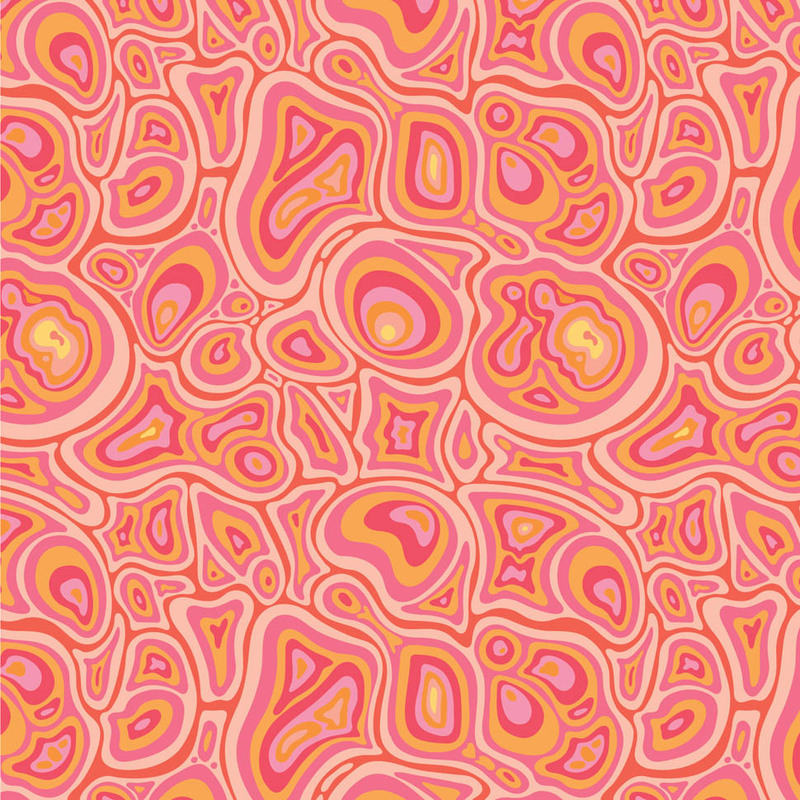 This course is pack full of all the technical things you need to know about creating patterns in Adobe Illustrator and on the business side of surface pattern design, but it also provides an encouraging space to have fun and explore your creative side that will lead to finding your style too. If you're ready to find the fun in your artwork, explore your creative side and find your style, click on the link below for all the information on the class and registration for the Immersion course. Don't dally though! This course is only offered once a year and registration closes on Tuesday, Feb. 26! See you in class! 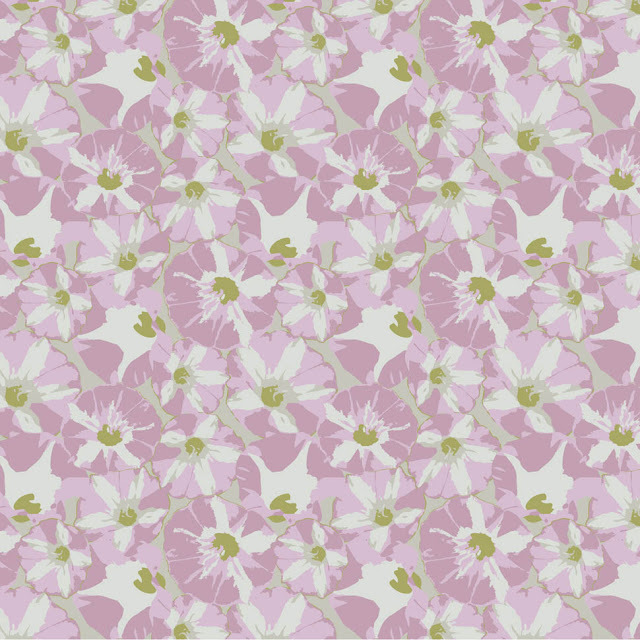 The best thing about Bonnie Christine's Surface Pattern Design Immersion Course for me was the encouragement and support to explore my creative side. As I've said before, I don't consider myself an artist but rather a doodler. 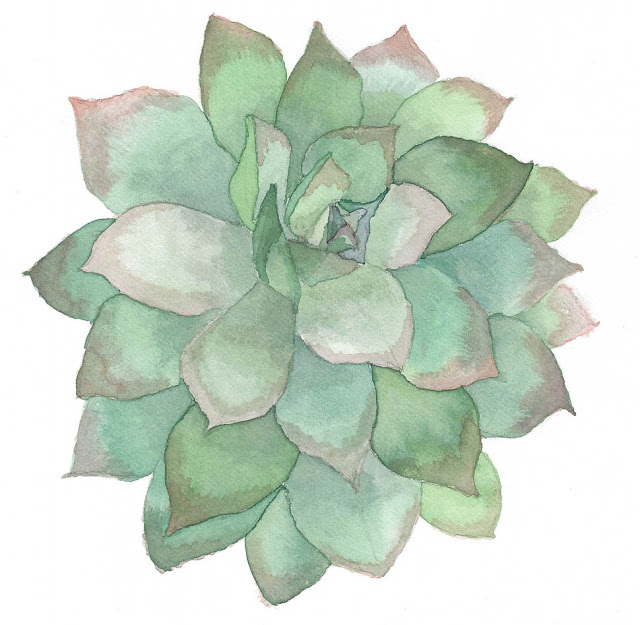 However, the Immersion course and all of my awesome classmates inspired me to get out of that proverbial box and try new creative outlets - like watercolor painting! But what was even better was that Bonnie Christine then taught me what to do next with those creative bits and pieces after I made them! Like using Adobe Illustrator to convert them into vector images and creating a repeating pattern that could be used on fabric, wallpaper, stationary, wrapping paper, and so much more. 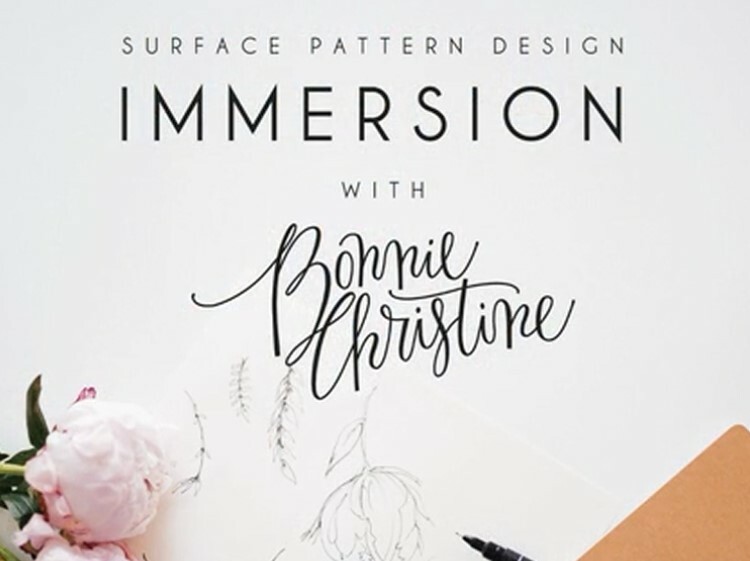 If the idea of creating products from your artwork appeals to you, then I encourage you to register for Bonnie Christine's 8-week Surface Design Immersion Course! 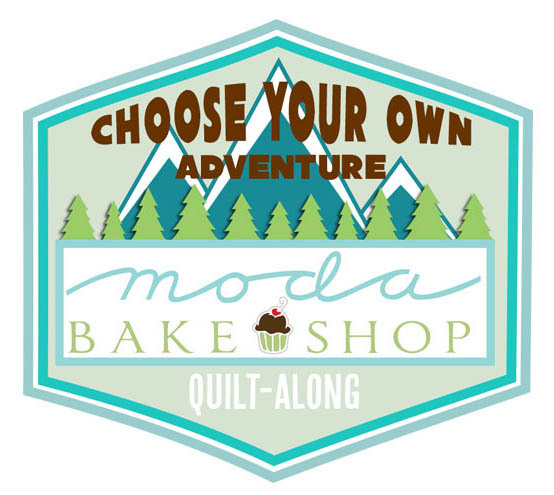 Registration is open only once a year and it closes Tuesday, February 26, 2019 - so don't wait! This course will open up a whole new creative world for you - just like it did for me! This time last year, I embarked on an eight-week adventure to learn how to use Adobe Illustrator to create my own textile designs. 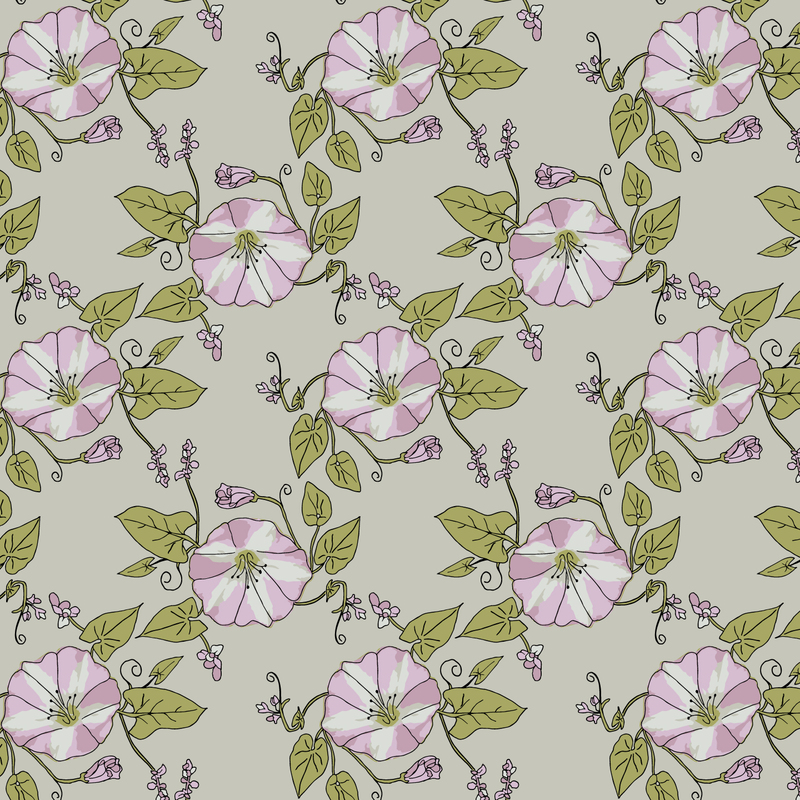 After looking at many different classes and courses, I landed on Bonnie Christine's Surface Pattern Design Immersion Course. I hadn't heard of Bonnie before nor had I taken any of her Skillshare classes but I just had a feeling that this was the course for me. And I was sooo right! 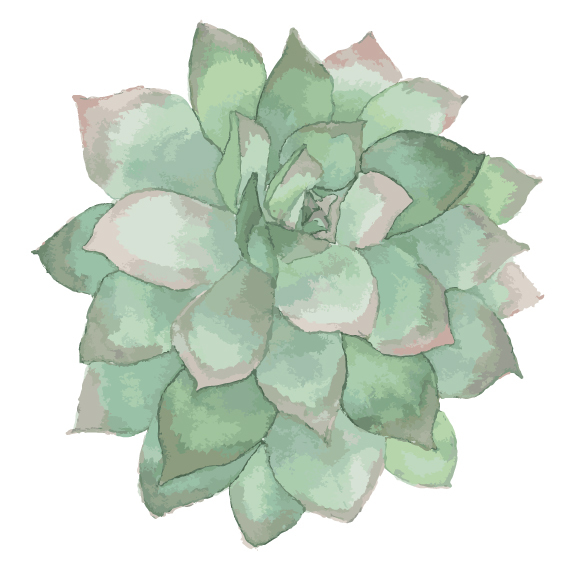 I can't say enough about how much I learned about Illustrator from the Immersion course. And I knew nothing to start out. I didn't even open the program for the first time until the first day of class. I knew it would be too overwhelming without some guidance. But from the beginning, Bonnie's knowledge of the program and her ability to explain each tool and how to use it in simple terms made the learning so easy and fun. But Bonnie's expertise in Illustrator wasn't the only thing she shared with her students. 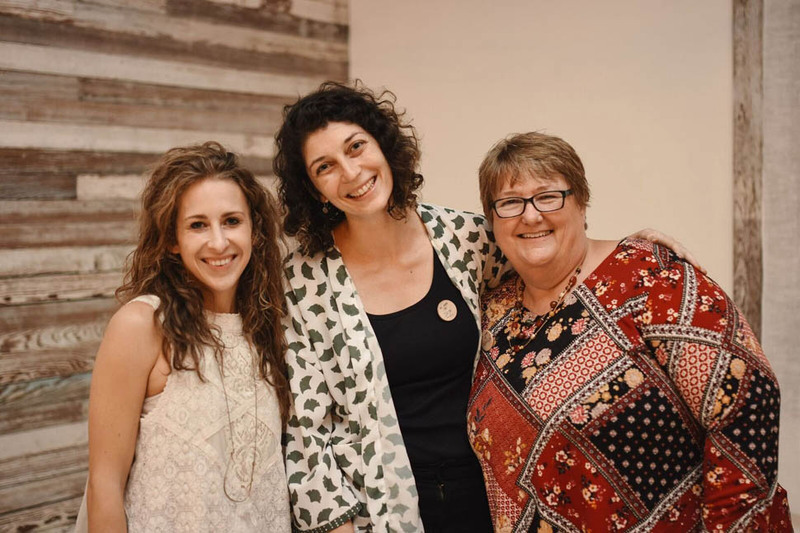 She also shared the business side of surface pattern design, from income streams to portfolio building to contracts and so much more. She also shared of herself, making herself available in video chats and Facebook groups, answering our questions as we worked through the course at our own pace. In fact, she still answers questions during her monthly video chat and in our FB group. 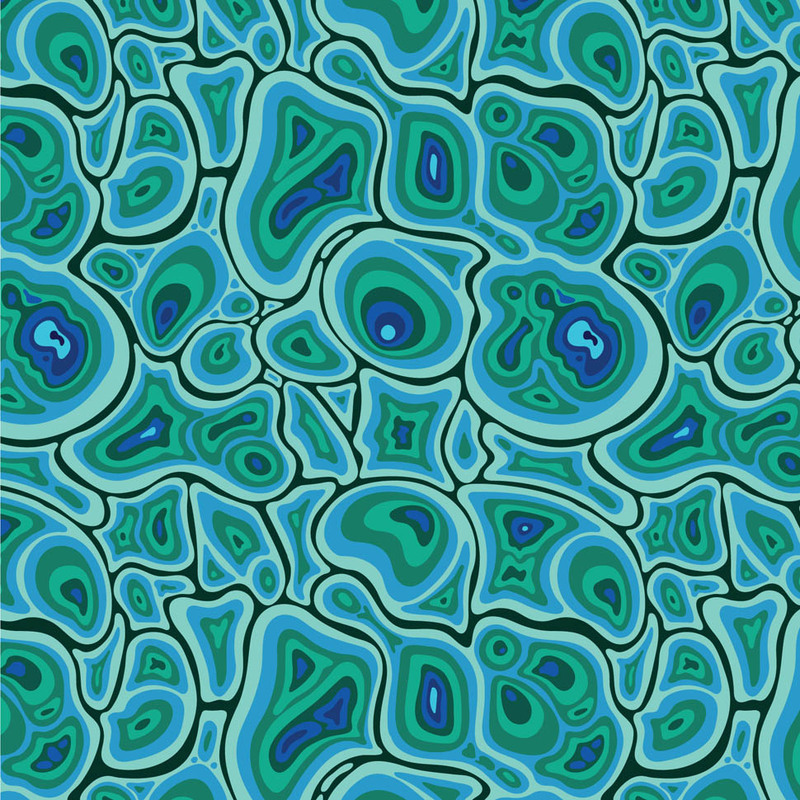 This, hands down, was the best surface pattern design course I've seen. If it sounds like something for you, then I hope you'll join me in class (yes, I'm taking it again as a refresher!). 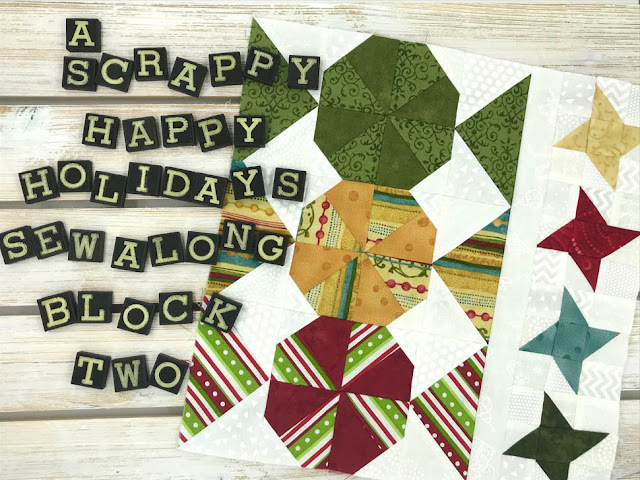 It's time to reveal the second block in A Scrappy Happy Holidays Mystery Sew Along! 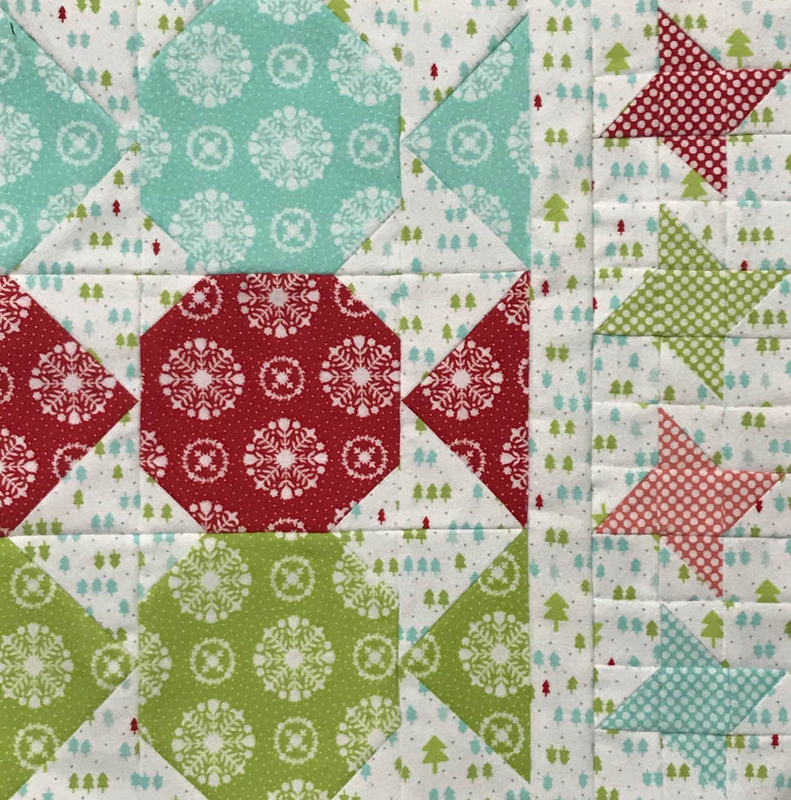 This block is Peppermint Candies and Twinkle Stars. I think it's so cute! There are two versions of the block. A simpler version that features whole peppermint candy centers as shown in this flannel block. And this version that features a pinwheel block to create a swirl in the peppermint candy. 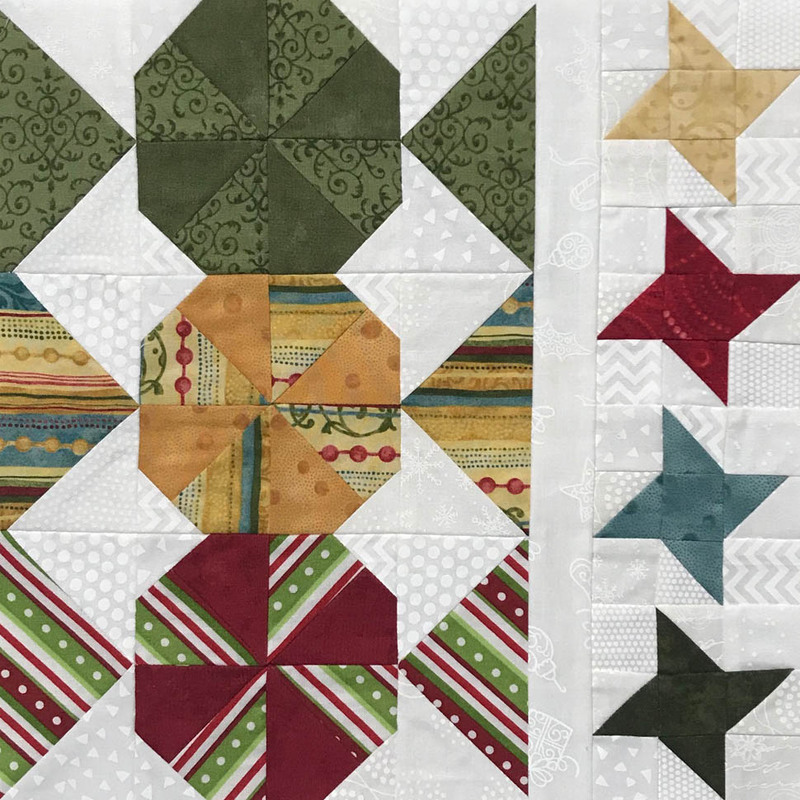 Both blocks are made up of simple half square triangles and flying geese blocks. I'm making two scrappy versions of this quilt and one with a coordinated collection of flannel called Vintage Holiday by Bonnie and Camille for Moda. I think the scrappy versions will be table toppers that I'll probably gift to my daughter and future daughter-in-law (Yes, my son finally proposed!!!). I'll add the final border option to the flannel quilt so that it's a snuggly quilt big enough to wrap up in. It's future destination is unknown. 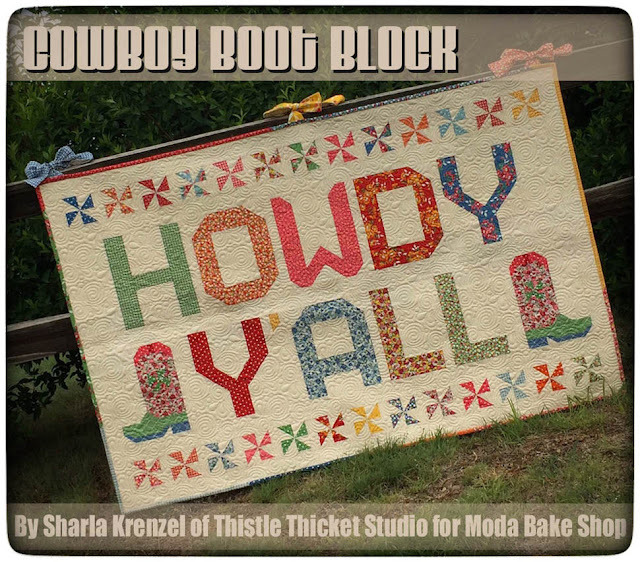 It's been fun to see a few of last month's blocks that people have made. 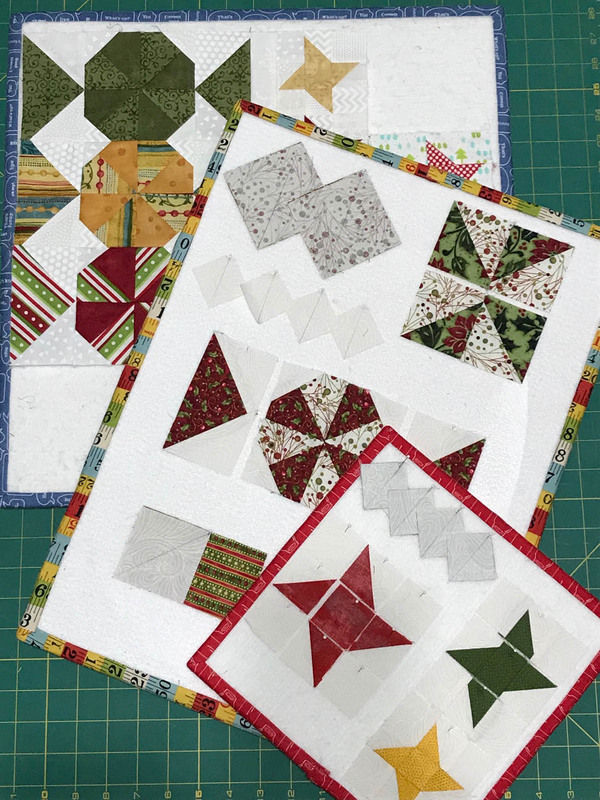 My quilt guild group is sewing along with the online group so I saw a lot of Holly blocks at our meeting last week. 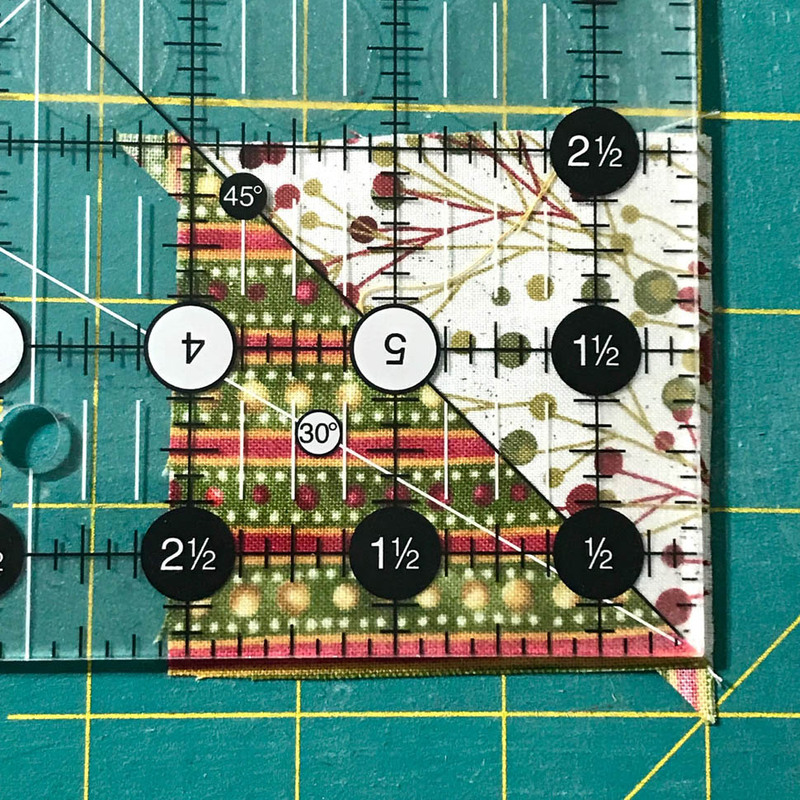 I am doing a little demo for each block at our guild meeting and pin the steps to foam core boards covered in batting and trimmed in bias binding. Some are Lori Holt (Bee In My Bonnet) design boards that I purchased and some are ones that I made from her tutorial here. They are handy for so many things. 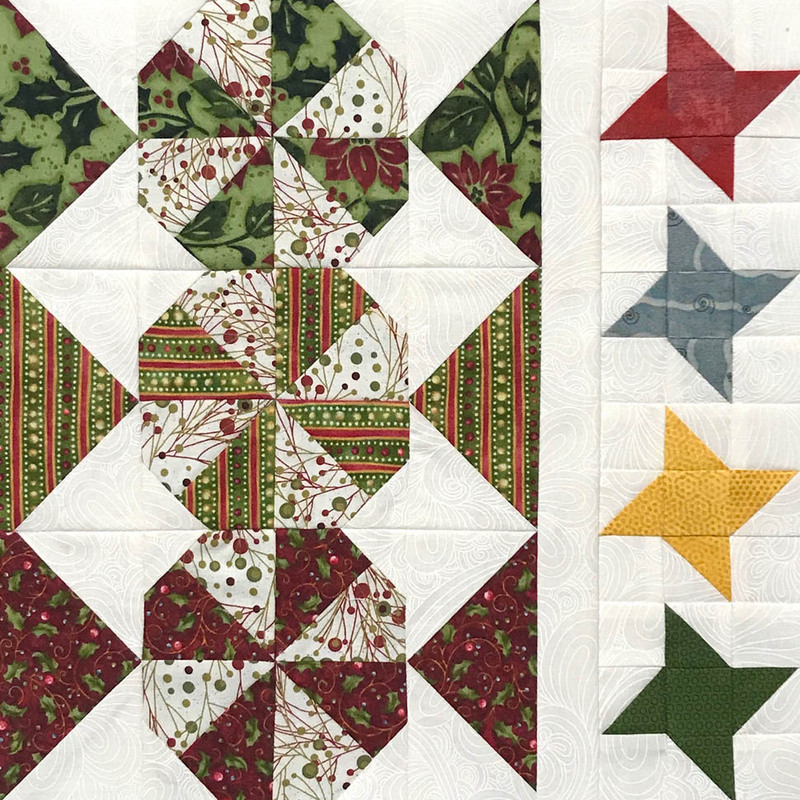 The only tip I have this month to make this block is to be sure to trim your HSTs to 2.5" before you sew your pinwheels for the peppermint candies (if you choose that option) or your squares will be too big. I can't wait to see your blocks! Post them on Instagram with the hashtag #ascrappyhappyholidaymysteryquilt so I can see them! Have A Scrappy Happy Day! Sorry! 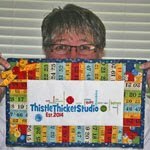 Registration for "A Scrappy Happy Holidays Mystery Sew Along" is closed. Happy Valentine's Day! It just so happens that our monthly second-Thursday-of-the-month quilt guild meeting falls on Valentine's Day today, so of course we are having a valentine exchange for roll call tonight. 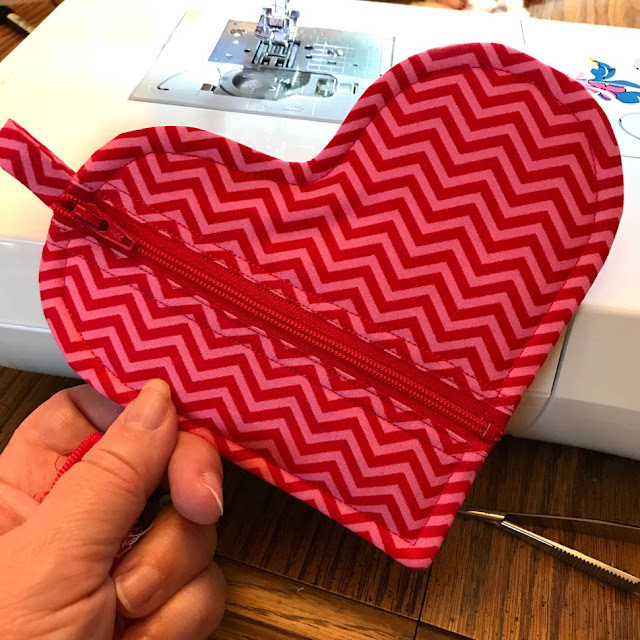 I'm hoping that the membership was inspired by my photo ideas (hints) that I shared of handmade valentines on our Facebook page a couple of weeks ago and we see lots of creative valentines tonight. 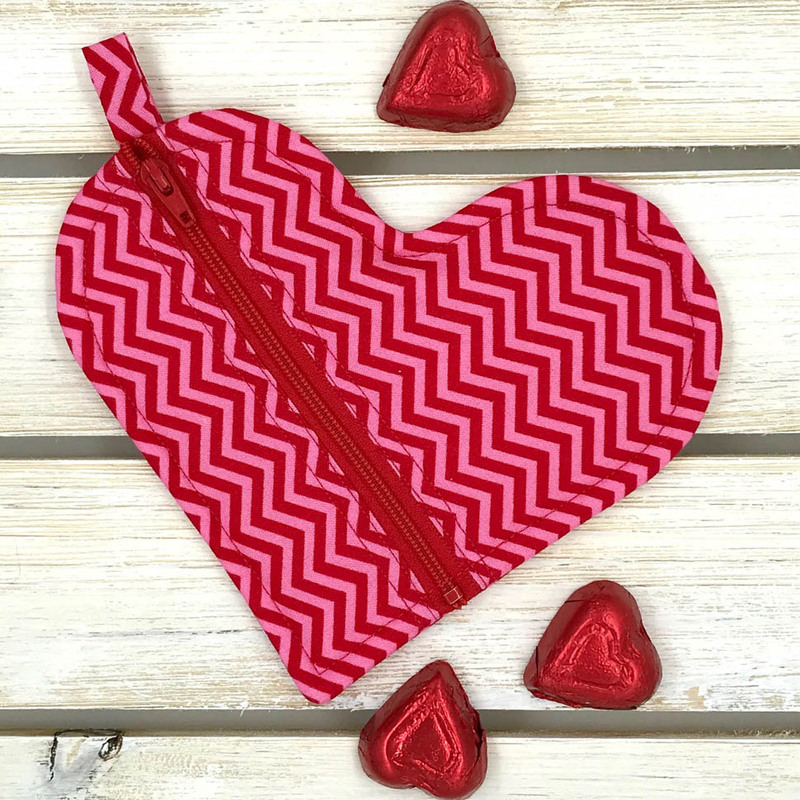 I pulled this red and hot pink chevron print for the outside of my heart pouch and the white with red dot for the lining. I kind of scanned a tutorial by Erin Erickson at Dog Under My Desk, by scanning I mean I looked at the pictures! LOL! Then I just winged it. It was really easy and a quick sew, and I'm really happy with the final product. I hope my valentine will like it tonight too! I'm not one that likes to give testimonials. They always feel pushy and a little fake. 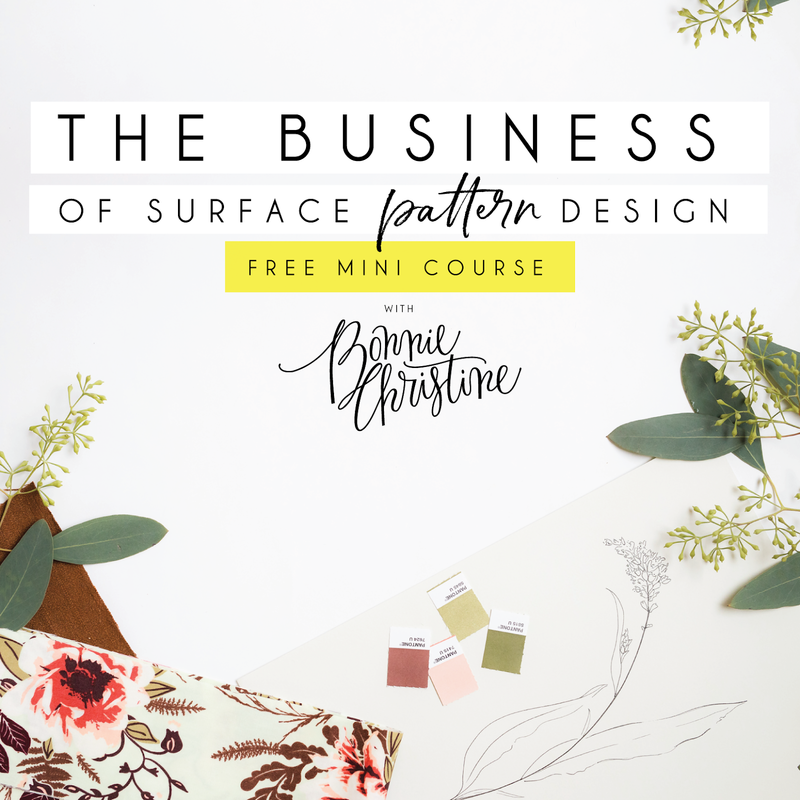 But I couldn't help but want to share about Bonnie Christine's new mini course called The Business of Surface Pattern Design. If you've always wanted to learn how to turn your artwork into surface patterns or want to design your own fabric (like me), wallpaper, wrapping paper, etc., then Bonnie Christine is the best instructor I've come across. 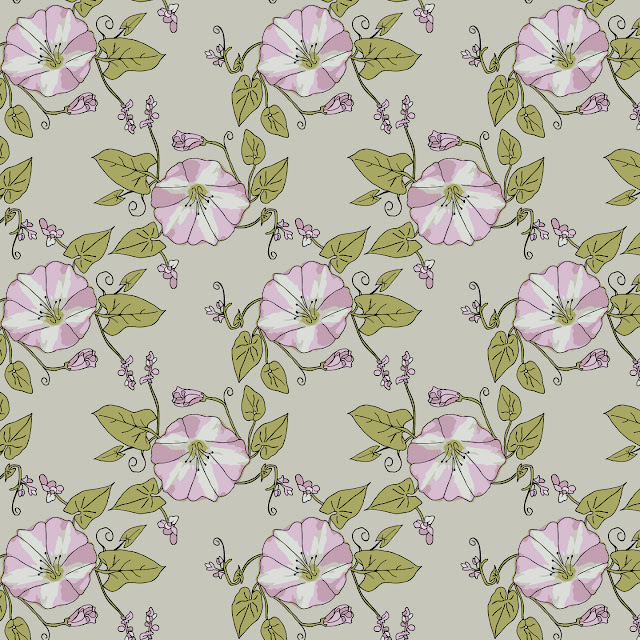 Last year, I took the plunge and enrolled in Bonnie's Surface Pattern Design Immersion course. I was nervous because I consider myself a doodler, not an artist. I had never even opened up the Adobe Illustrator program much less know anything about how to use it. It was the best class experience I have ever had the pleasure of participating in. Bonnie's in-depth knowledge about Adobe Illustrator, her willingness to share her knowledge about the industry and what kind of income can be possible (she even shared her income and expense stats throughout her design career). Her classes were thorough and easy to follow and understand, and her willingness to answer questions, critique work and be your personal cheerleader was so wonderful. 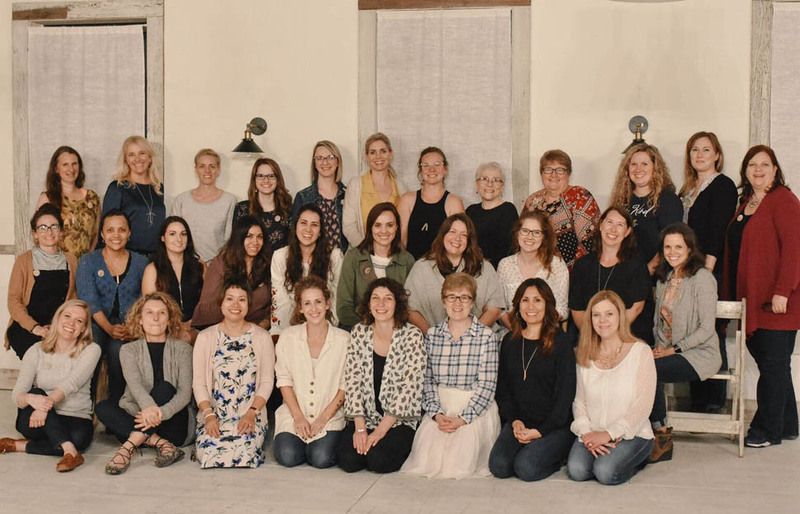 And of course, the opportunity to attend the Immersion Retreat and spend three creative days with Bonnie and fellow classmates was so inspiring! The Business of Surface Pattern Design course is a free mini course and will provide insight into the art of finding your signature style, how to stand out from the crowd, exploring different income streams and possibilities, and how to promote your work like a pro. This free course will give you a sneak peek into Bonnie's teaching style and provide you with some great info. 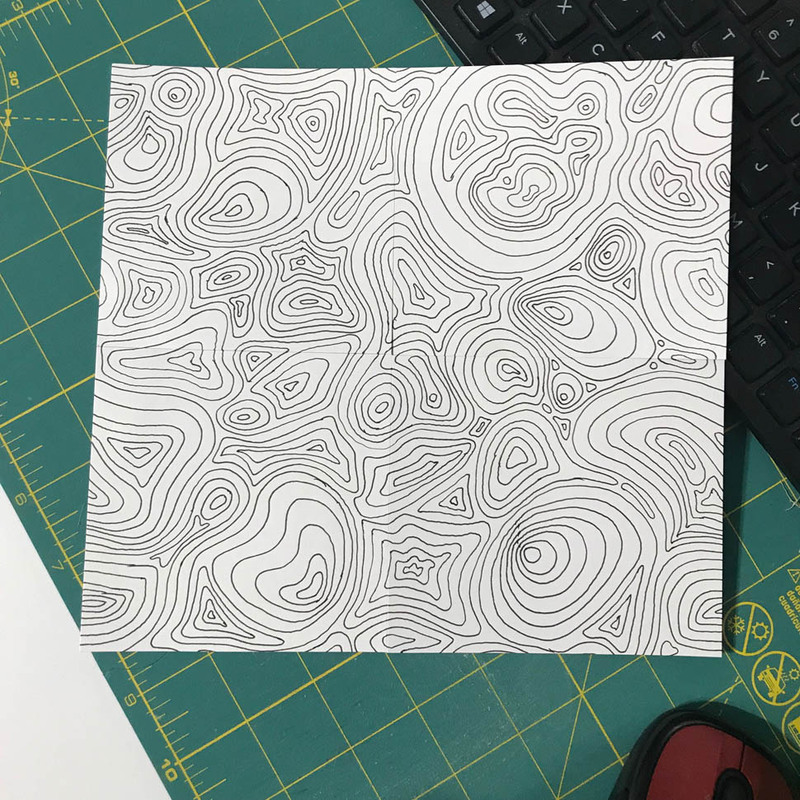 It's a great way to see if the Surface Pattern Design Immersion course may be for you in the future. Want to join me for Bonnie's free mini course on The Business of Surface Pattern Design? 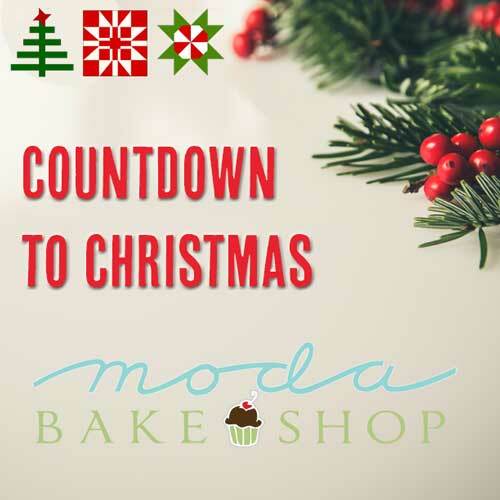 Then click here to register, and keep an eye on your inbox for the first lesson to arrive this Monday, February 11! See you in class! 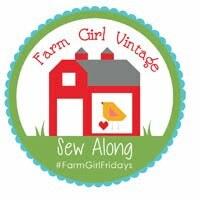 Bonnie has a surface pattern design membership group called the Flourish Surface Design Dig that I'm a member of. 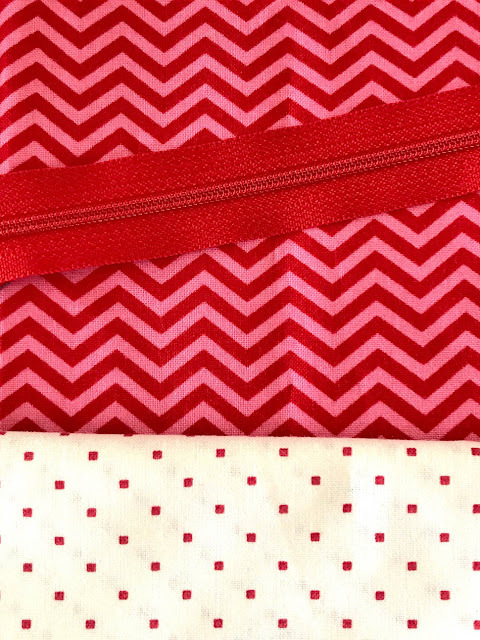 This year, she has a monthly design challenge to help us create surface patterns for our portfolios, collections, etc. The month of January seemed so busy (with what, I don't know!) so I didn't get around to opening up the email with the challenge details until a couple of days before the deadline of January 31. Her prompt for the January design was to pick a word of intention for the year and create a design that represented that word. Ugh! I'm not good with that sort of thing. But I forged ahead because I wanted to participate. Trying to choose a word had me stumped. 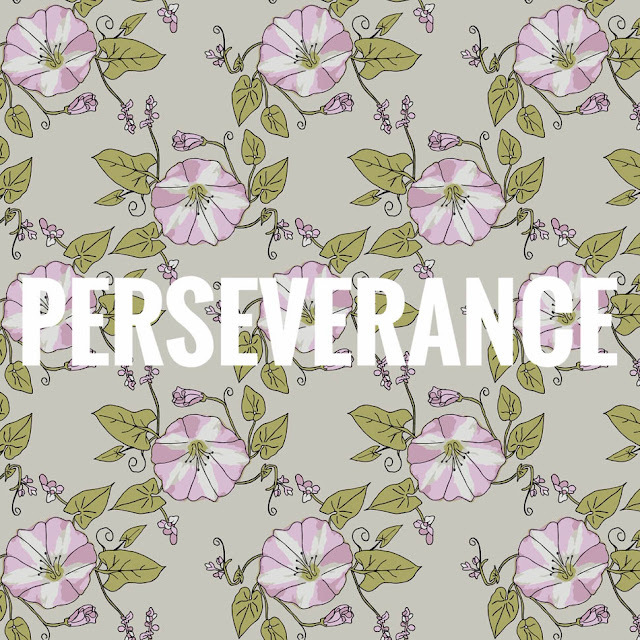 But after the lackluster responses I received at market on my portfolio, I knew I could easily quit and give up, which is something I really don't want to do - so I began looking at words like persistence and persevere. I wanted to represent my word with a floral drawing so I researched what flowers might represent any of these words. 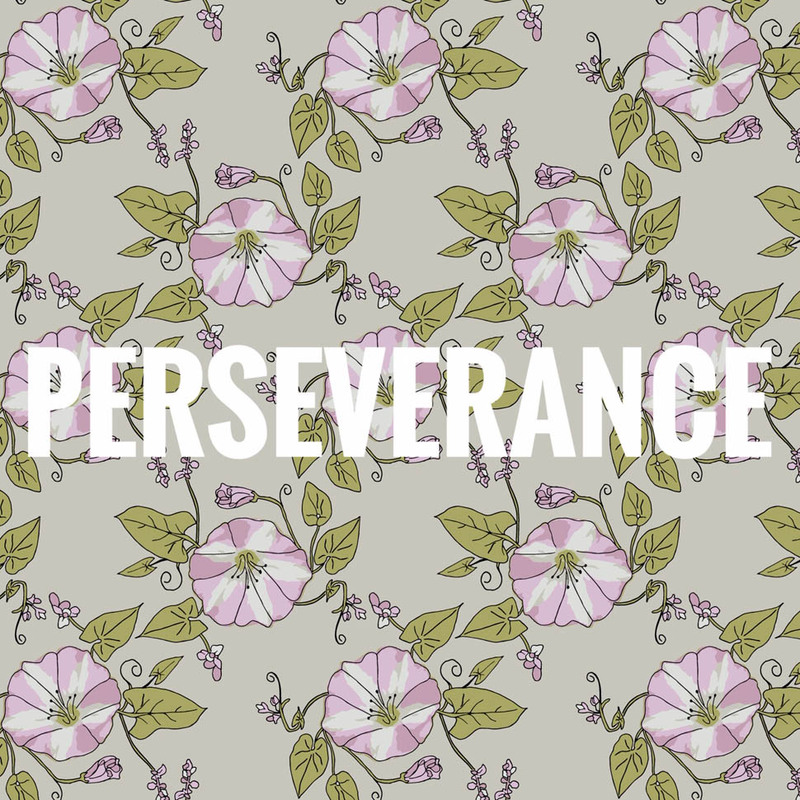 I hit upon the word 'perseverance' when I found that bindweed, that noxious weed we continually fight on our farm, symbolized it. (Just to be thorough, the magnolia also symbolizes the word perseverance, but it isn't a flower/tree native to western Kansas so it has little meaning to me.) So I set about sketching a bindweed flower and it's arrow-shaped leaves, which is really the identifying part of the plant. 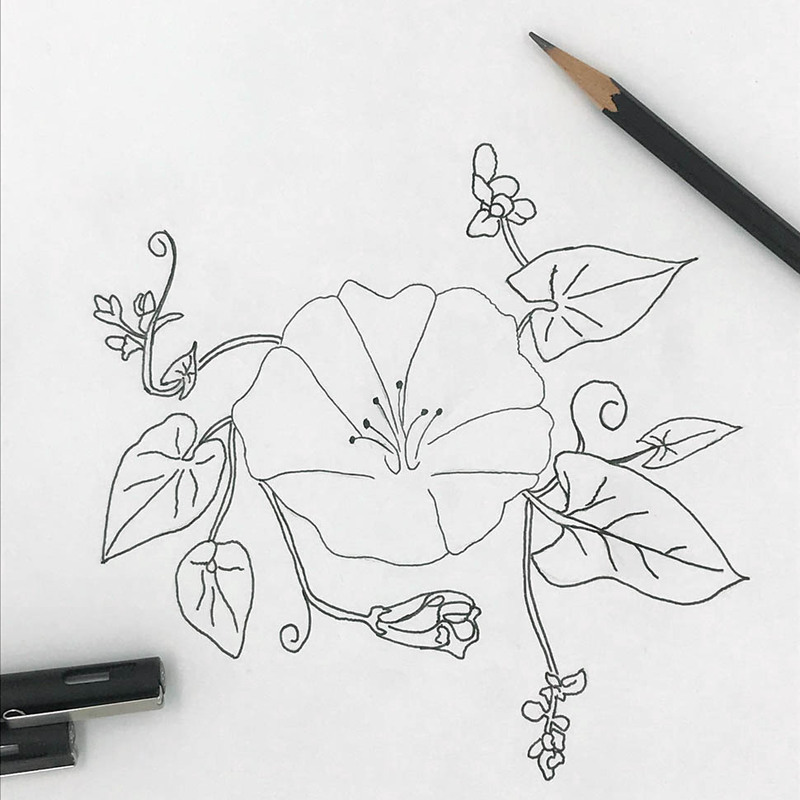 I was thrilled when my farmer hubby identified my drawing as bindweed without hesitation! The background in the first photo is my finished design. I was really happy with the design and the limited color palette I used. But, one of the comments I received at market about my designs was the use of outlines on my motifs. It gives the designs a vintage feel, which I like and I feel is my style, but on more than one occasion I was told by art directors that their company did not have any more room for vintage-inspired designers. So I decided to play around with my flowers and create a pattern without lines and this is my first attempt. I didn't have a lot of time to work on this because, as I said, it was near the deadline and I was actually spending the next 4 days at my mom's for her annual Sisters Sewing Retreat, which is always a fun way to celebrate her birthday. Hopefully next week I'll have a couple of quilt finishes from our retreat to share (tops are finished but needs to be quilted)!